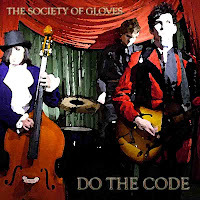 The Society of Gloves: Album Art: "Do the Code"
There are actually two versions for "Do the Code," so far, that is. The first, recorded in February of 2007, is the demo that Mutiny Universe used during the production of their film Elan Vital. It's a boogie woogie, piano rock 'n roll tune, so it's heavy on the piano and light on the guitar. The second try at "Do the Code" is an official Society track. Recorded in April of 2007, it is a slight rearrangement from the first "Do the Code"; there are two guitars playing this arrangement; and the piano has been replaced by a Hammond B5. It's essentially a homage to 70s classic rock doing an homage to 50s rock 'n roll. Needless to say, it really doesn't fit in to the other Society songs, so it's a bit on the B-side spectrum of music. It used to be on our Myspace, but I've taken it down to reserve room for newer songs. Where is my mind? The cover art depicts the Elan Vital band. We've slightly obscured the people through some sloppy Photoshop plugin work, but all three actors are also great musicians, though they didn't play on "Do the Code." The fake band looks cool.